Accurately reach prospects and customers online, across multiple screens and devices. Throtle Data Onboarding helps you precisely and deterministically target individuals, even when they are otherwise anonymously browsing on a laptop or mobile phone. Throtle Data Onboarding connects CRM files or email subscriber lists with online cookies and mobile devices (MAIDs). We enable brands to confidently target, create more personalized experiences, and measure engagement across multiple channels, browsers, and devices – all in a privacy-safe manner. Throtle prides itself on providing brands with the most accurate and transparent view of their customers. We are the only data onboarder that applies decades of data expertise to properly cleanse and prepare data. With a rigorous hygiene and repair process, we organize, enhance, and activate customer CRM data and email subscriber lists so that brands can effectively reach their customers online with targeted messages. Throtle’s rigorous hygiene and repair process prepares and enhances data to achieve higher and more accurate match rates. With access to the Throtle Individual Truth Set, we are able to match one- to-one: deterministic and authenticated, across all screens and devices. Add missing identifiers to individual’s profiles, enabling brands to increase their reach via cookies and mobile ad IDs – by as much as 20% more. Throtle has an active and vast network of industry-leading DSPs, ad networks, and platforms to deliver your campaigns, so you can get the right message to the right person at any time. Extend is a unique data matching extension process that adds missing online identifiers to an individual’s profile, allowing brands to increase their online reach. Consumers regularly switch between devices and email addresses when shopping online, making it more difficult for brands to connect with the right individuals using a single email address or device. With Extend, brands can append Throtle’s known customer IDs to their pool of anonymous IDs and detect previously unknown customers. Accurately identifying these customers is the key to improving customer experiences and campaign results. How does the Extend process differentiate from other onboarding processes? We maintain an exclusive and proprietary database of consumer match keys. 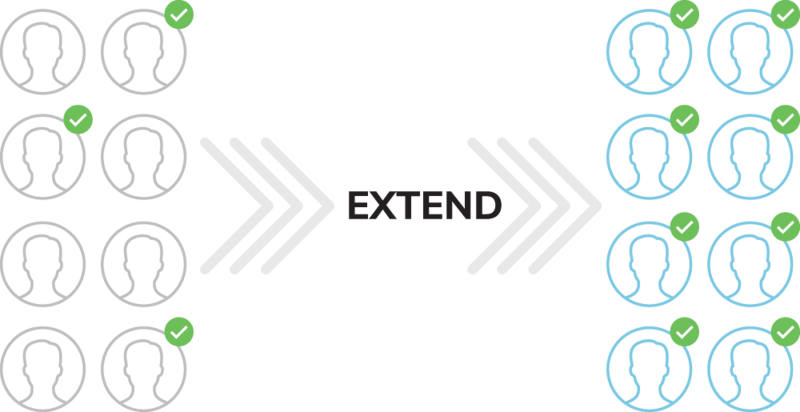 Extend combines the quality of its consumer match keys with the accuracy of its individual and deterministic match pool, to create a process that no other onboarder has at scale. What type of data is matched? Extend uses a variety of match criteria including email [hashed 3 ways], device ID, mobile number, and IP address.